If you’re especially worried about the security of your home wireless network, or if you’re the kind of person who wears tinfoil hats to avoid the effects of electromagnetic waves, this wallpaper could help ease your mind. 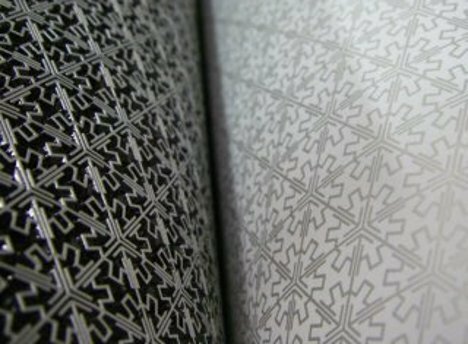 The wallpaper is covered with silver crystals arranged in patterns that were specially designed to block certain frequencies. When ordering the wallpaper you can choose which frequencies to block and which to allow, so wi-fi signals can be stopped from leaving your residence while cell phone calls are allowed to go through. Neighbors won’t be able to steal your wi-fi, and exterior electromagnetic waves can be kept out. 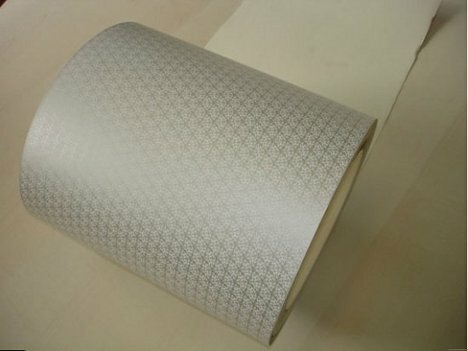 The wallpaper won’t block radio or emergency signals, and if you don’t dig the silver snowflake motif you can paint over it or install your choice of other wallpaper over it without affecting its functionality. Of course, to maximize the efficiency of a product like this you would need to install it on all of your walls, your floors and ceilings, and your windows. Perhaps future home builders will start building barriers like this right into the walls of new structures so we won’t have to fiddle with installation later. Finnish company Ahlstrom is expected to release the wallpaper in 2013 at a price that is on par with regular, non-paranoid-people wallpaper. See more in Home & Personal or under Gadgets. May, 2012.